We're proud of our first movie. 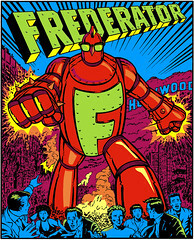 Another three months, and another newsletter from your friends at Frederator Studios. But wait! There’s a theme here. Can you guess what it is? Robot hats off to My Life as a Teenage Robot’s Seonna Hong, brand-new Emmy-winner in the category of Individual Achievement in Animation – Background Styling. We couldn’t be happier or more fortunate to have this talented artist on the Robot team. The award ceremony is being aired on E! this Saturday night (9/18). While you can see Seonna’s beautiful work at www.SeonnaHong.com, we’ve included a Seonna background from the episode for which she won – The Wonderful World of Wizzly – here. Well, we’re finally on the schedule. After months of no new episodes, the second-season Teenage Robot premiere is slated for its Nickelodeon debut Friday, October 1. Entitled “Victim of Fashion”, it’s a very special half-hour episode full of fashion, victims, and robots. Check your local listing for showtimes. It’s going to be Robot-riffic. Jenny Wakeman, you’re going to Canada! That’s right, the very prestigious Ottawa International Film Festival has nominated My Life as a Teenage Robot in the Television Series for Children category. The specific episode up for the prize is “Speak No Evil” (the one where Jenny can speak nothing but Japanese – oh, and that’s Janice Kawaye who supplies Jenny’s regular voice doing all the Japanese dialog, too), directed by creator Rob Renzetti and Tim Walker. Thankfully, the festival’s not until next weekend, so there’s still time to brush up on our Canadian, eh. Thanks for reading. Look for our next harassing sometime in the winter. Questions, comments, complaints? Or you just don’t want our Frederator updates? Let us know at Hey@frederator.kz.